The process of bringing what we know, how we think and what we measure into being is called design. Whenever we are trying to creatively solve a problem, synthesize different pieces of information, and create something new that addresses underlying challenges, we can use design thinking. Design thinking is an approach to problem solving that looks at how current systems are structured, and seeks to create new structures as a solution. Everything around us has been designed. Design is everything that sits in between one another. It mediates our relationship to each other and the world around us, and reflects our values, perceptions and in turn forms our experiences. The structures and spaces that have all been designed, from cities to organizations and information, shape us endlessly, but who gets to shape these designs? Democratic and participatory design is key to creating a just and vibrant world. Co-creation is how we value the diversity among us, because differences in experience, talent, perspective, identity and passion can be combined to form a clear picture of what we need to do. This is the process that makes design human-centered. As we all learn this process of design thinking, we understand that difference is valuable, not a reason to be apart. Because it has the power to shift how we value each other, the design of systems and places is a fundamental human activity in which we can all participate. Furthermore, being able to thoughtfully design for yourself and with others is a key barometer of agency. Through design, we can create freedom and self determination for one another, or we can box each other in and limit our potential. Thus, the design of places, systems and plans must be a living process. We see design as an iterative, visual and accessible process with communities: not a one-off, arcane and top-down process for communities. That’s why we need a long-term infrastructure to facilitate community-driven design and development in our neighborhoods. If what we measure is what we value, then we need to measure what we want to see in the world. When we compare a map of outcomes like health, education, housing and income, we are certain to find that those areas where our metrics are highest will be those ‘green’ areas on Redlining maps, while the areas performing the worst will be historically red. So long as we measure only this, our solution will always be to simply raise the red areas up to the level of green. But if you know anything about redlining, you know that green and red areas are interconnected. You can’t get red areas without other places being green, because they are part of one system. So we have a simple question. Could we also measure something that would give a green area a bad rating? What about something like ‘social isolation?’ Indeed these are largely white, wealthy areas with gross homogeneity. They are badly isolated. If we think about the neighborhoods we want to see in an ideal world, we may describe them as a thriving, diverse communities where many different people work, access opportunity and create together sustainably. Yet this narrative doesn’t describe ‘green’ areas. So why do those areas show up at the top of all our metrics? What should we be measuring so that the world we want to see gets ranked highest? If our metrics showed this diverse and collaborative community at the top, then we know the solution is to bring both ‘red’ and ‘green’ communities closer to this ideal. We would look to the whole system. These outcomes, like social integration and cohesion, agency, trust, creative and cultural production, a sense of place, access to opportunity, civic engagement, happiness and well being, can only be gathered through a robust and ongoing process of community engagement and crowd-sourced data mapping. 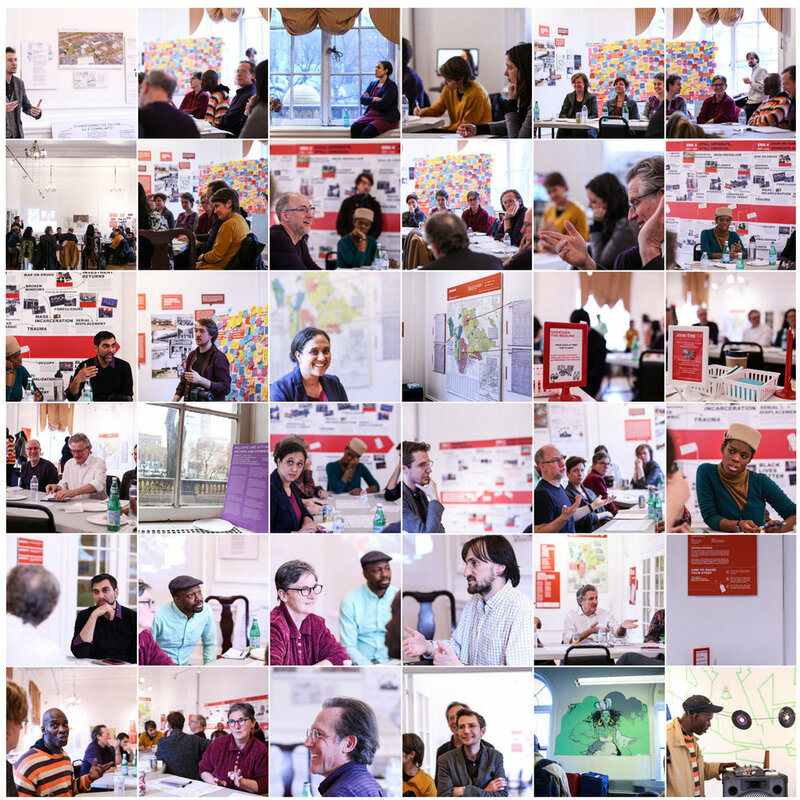 Using tools like Participatory Action Research, predictive analysis and anthropological approaches become critical to shifting systems of measurement, as well as giving communities the power to decide what is important to measure. We want to be sure that we have the ability to measure, and therefore to value, the world we want to see. This is true in historically redlined places as well as small towns and suburban places. This is why community-driven data is so important if we want to break out of the system that says wealthy, white and isolated neighborhoods will always be the best. To change our approach we first have to change our perceptions. Once we are grounded in a shared understanding of our history, and desire to ‘undesign’ it, we can begin to challenge how our own perceptions are driving the way we design. We all have a lot of healing to do, because these toxic systems like redlining have shaped how we see the world. Without this humanistic intentionality, we often end up reproducing the problems in society we are trying to solve. These intentions become real in the design process. We learned this when working in a small city to co-create proposals for an economic development strategy. Many people with tremendous community development experience and warm hearts were around the table. Two ideas, both important and needed, came to the forefront of their mind. One was to create a day laborer center so that day laborers could have a place to wait for work, and perhaps access services like language classes and immigration lawyers. The other idea was for a young and emerging artist maker space and entrepreneurial center. The hope was that with some investment artists and entrepreneurs could transform the town into a thriving place. But then someone from the community asked a simple but important question: don’t young artists also look for gigs? Indeed, many of them were looking for work from job to job or gig to gig much like the day laborers. We asked ourselves, what’s the difference between day laboring on the one hand, and something like freelancing on the other? The only consistent differences we found were along lines of race and class. We were creating two separate places, one where folks could access some services, and one where folks would be given access to resources and investment, and we were doing it along lines of race and class. Not only do these two groups actually have much in common, but their differences can be seen as ways they are valuable to each other. Day laborers can teach craftsman skills in a maker space to young people, and now we can call them our teachers. They are also very entrepreneurial, and would prefer not to stay day laborers. Perhaps it won’t be just artists that transform the town, but new relationships between these different people that we can’t even imagine yet. The new project we designed would allow for that. Even with good intentions, our perceptions and lack of intentionality kept us stuck in a place where we were re-creating redlining and greenlining. Now this town is on its way to creating the kind of world we all want to see. This past Saturday, nearly a hundred people packed into the Mary Mitchell Family and Youth Center to share and build support for a new kind of development project. Led by the New Crotona Coalition, the Astin Jacobo Center will bring to life a new food hub, maker space, classrooms, music recording studio and co-working space in a vacant building located in center field of a baseball field in the Crotona section of the Bronx. The project exemplifies what's possible through Designing the WE's Transformative Design process. How this opportunity came to be has a long history that includes the systemic forces that led to the destruction of 90% of the neighborhood’s housing stock, the community organizing that rebuilt the neighborhood and turned the rubble of this block into a baseball field, and the design process Designing the WE was brought in to lead. Beginning in the spring of 2016, dtW implemented our design curriculum with a series of nine Friday evening classes for the young people and staff of the Center. Beginning with their own current experiences and working backwards through the eras of broken windows policing, disinvestment, fires, epidemics, racial change, urban renewal, and the building and dismantling of the Third Avenue El, the young people and staff identified challenges, opportunities and the actions they could take in response. They also interviewed neighborhood elders about how the neighborhood had changed over the years. A common theme was how development projects were typically controlled by people outside the neighborhood. After exploring examples of innovative economic development models, the youth and staff identified a number of values they wanted to be present in the new development. Specifically, the group agreed that the building should house a cooperatively owned, inter-generational space where elders could train young people in practical skills that could help them both express their creativity and launch businesses. In other words, this building should be the hub of a new ecosystem that connects people and their projects and businesses in a cooperative and collaborative manner, addressing and undesigning decades of systemic racism and structural inequality -- exactly what our WElabs are designed to generate! Three small groups brainstormed and sketched ideas. One group designed Mapes360, a makerspace that would house wood and metal shopping equipment along with 3D printers and other technology. Another group centered their design around a shared commercial kitchen that could both provide healthy food to people in the neighborhood and launch small businesses. A third group looked at classrooms and performance spaces that allowed people to connect in a myriad of ways. In early June, the staff and young people presented early sketches to key neighborhood leaders. Since then, they have been out conducting hundreds of surveys and building broader support for the project. This fall, architects were brought in to turn the visions into tangible drawings. On Saturday, they young people and staff presented the project proposal to large crowd that included Representative Jose Serrano and City Councilmember Richie Torres, both who have pledged their support. Designing the WE is thrilled to participate in this groundbreaking project design and implementation, guiding the process with such amazing and inspiring people! "The political context of this city-led reinvestment plan presents a unique opportunity for AIGA/NY to accompany public engagement and support community development, leveraging designers’ capacity to devise engaging cultural, graphic and communication strategies. It is a one-of-a-kind chance to align the New York chapter with city agencies to advance the field of creative placemaking and build up our mission: to advocate for design within the city’s civil and cultural life." Benefit Corporations are a fast growing tool within the social impact sector. It conveys and represents to consumers and end users a company's commitment to scaling beyond just profit driven goals, but how the brand connects to an ecosystem of social impact.